Rare first edition of Mitchell's map of Virginia. This is a scarce first edition example of S. A. Mitchell and H. N. Burrough's 1846 map of Virginia, including West Virginia. 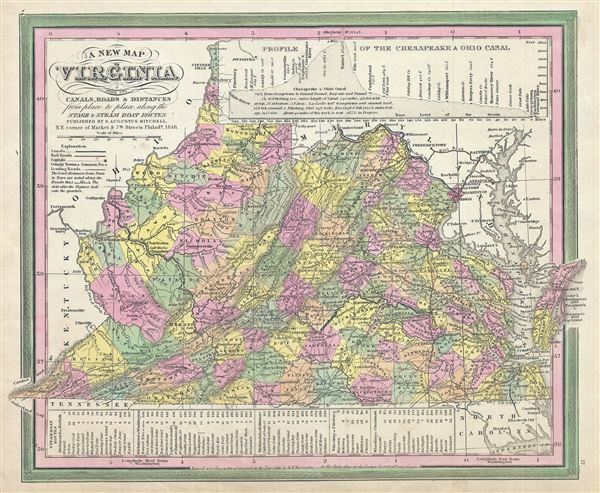 This hand colored lithographic map predates the 1862 separation of Virginia and West Virginia, and so contains both modern states in full as well as parts of adjacent Kentucky, Ohio, Maryland, and North Carolina. A list in the map's lowers left quadrant shows various steamboat routes, along with mileage. The Chesapeake Bay in particular, in rendered in full while a profile in the upper right details the elevations of the important Chesapeake and Ohio Canal. Operated until 1924, the Canal, which paralleled the Potomac connected the Atlantic to the Ohio River, and was a vital artery for trade between the populous Atlantic coast and the rapidly developing American interior. This is a rare transitional map produced by the mysterious engraver H. N. Burroughs, whose work for the Mitchell firm appears in 1846 between that of H.S. Tanner and Mitchell himself. Ristow notes, 'Nothing is known about Burroughs, but he was undoubtedly an employee or associate of Mitchell.' His fine and detailed work appears only in the hard to find 1846 edition of the Mitchell's Atlas. Dated and copyrighted 'Entered according to Act of Congress in the year 1846, by H. N. Burroughs in the Clerks Office of the Eastern District of Pennsylvania.' Issued as plate no. 17 in the 1846 edition of Mitchell's New General Atlas. Rumsey 0537.018. Philips (Atlases) 6103.